Protologue: Bull. Mus. natl. Hist. nat., Paris 9: 37 (1903). 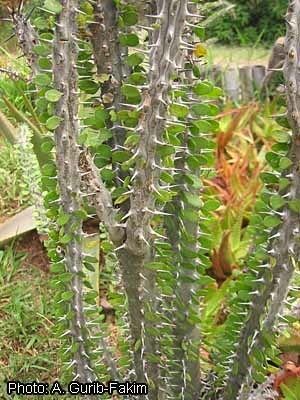 Alluaudia procera is endemic to south-western and southern Madagascar, north to the Mangoky river. The bole is often sawn in rough planks to be used in local house construction. The wood, known as ‘fantsilotra’, is also commonly used for boxes and crates. It has been used for containers for tobacco and vanilla because it is odourless. It is suitable for interior trim, furniture, laths for tile roofs, supporting framework, veneer for inner layers of plywood, and particle board. It is used as firewood and for charcoal production. Alluaudia procera is in great demand as an ornamental and is the most common member of Didiereaceae in succulent collections. The heartwood is whitish yellow and indistinctly demarcated from the 4–5 cm wide sapwood, which, however, often becomes greyish to greenish upon exposure. The texture of the wood is moderately fine. It has a mottled structure because of the presence of large rays. The wood is lightweight, with a density of 380–480 kg/m³ at 12% moisture content. It air dries rather well, without distortion. A board of 4 cm thick can be air dried in 5–6 months. The rates of shrinkage are low to moderate, from green to oven dry 1.6–3.2% radial and (3.8–)5.0–6.7(–8.5)% tangential. At 12% moisture content, the modulus of rupture is 53–83 N/mm², modulus of elasticity 3500–7150 N/mm², compression parallel to grain 22.5–38 N/mm², shear 3–5.5 N/mm², cleavage 8–14.5 N/mm and Chalais-Meudon side hardness 0.8–1.6. The wood is easy to saw. It holds nails and screws fairly well, and the gluing and painting properties are satisfactory. It has good slicing and peeling characteristics. The wood is not durable, and liable to attacks by fungi, especially blue-stain fungi, termites and wood-boring insects. However, planks of local houses may last more than 5 years when they are not in contact with the ground. The wood is easy to impregnate with preservatives. Deciduous, dioecious small tree up to 15 m tall; bole branchless for up to 6(–10) m, cylindrical, up to 40(–55) cm in diameter; bark thick, surface whitish to grey, inner bark reddish; branches upright, with many, stout, 1–2 cm long, solitary spines. Leaves in pairs below each spine, simple and entire, thick and fleshy, with vertical blades, nearly sessile, caducous; stipules absent; blade elliptical to oblong or obovate, 7–25 mm × 4–12 mm, glabrous. Inflorescence a lateral, large panicle 12–30 cm in diameter, grouped near ends of long branches, consisting of cymes, many-flowered. Flowers unisexual, small, greenish yellow to whitish, sweet-smelling, with short pedicel, each flower subtended by 2 cap-shaped, slightly unequal, c. 2 mm long bracts; tepals 4, broadly ovate, c. 2 mm long, outer 2 slightly larger than inner 2; stamens 8, fused at base, 4 longer and 4 shorter, hairy at base of filaments; ovary superior, ovoid to slightly 3-angular, 1-celled, style very short, stigma with 3 large, irregularly incised lobes; male flowers with rudimentary ovary, female flowers with rudimentary stamens. Fruit a top-shaped nut 2–3 mm long, enclosed by the persistent bracts and tepals, indehiscent, 1-seeded. Seed with thin seed coat and whitish caruncle. The growth of seedlings is slow; seedlings are on average only 2 cm tall after 6 months, although some may reach 25 cm tall after 14 months. Taking into consideration the climate and the dry, sandy soils in the area of distribution, established Alluaudia procera trees grow quite rapidly. Annual growth rates of 100–175 cm in height but only 2–3(–6) mm in bole diameter have been recorded, whereas annual wood volume increments in natural stands are 0.6–5.0 m³/ha. In plantations of 11 years old raised from cuttings, the largest trees were 8 m tall and 10–20 cm in diameter, but most of them had a bad bole shape. Alluaudia procera flowers in September–October and fruits are ripe about one month after flowering. The flowers are probably pollinated by bees. They open in the late morning and wilt already in the afternoon of the same day. The fruits are dispersed by wind. Crassulacean acid metabolism (CAM) has been found in Alluaudia procera and other Alluaudia spp., fixing carbon dioxide during the night and having the stomata closed during the day. This can be considered an adaptation to arid conditions. 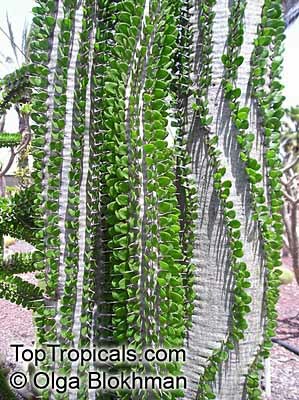 Alluaudia comprises 6 species and is restricted to south-western and southern Madagascar. The wood of some other Alluaudia spp. is undoubtedly used for similar purposes as that of Alluaudia procera. Boles of Alluaudia ascendens (Drake) Drake, a small tree up to 12 m tall with bole up to 50 cm in diameter limited to southern Madagascar, attain sufficient diameter to be used as boards for local house construction. The wood is also used as firewood and for charcoal production. 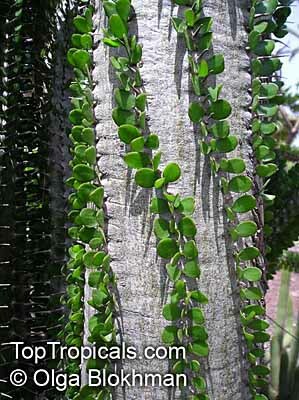 The wood of Alluaudia dumosa (Drake) Drake, a shrub or small tree up to 8 m tall limited to southern Madagascar, is used for utensils, boxes and crates. A decoction of the stems is used to treat toothache and as mouth disinfectant. Several flavonoids have been isolated from Alluaudia dumosa; these may be responsible for the claimed antimicrobial activity. Alluaudia procera occurs in dry forest and thickets, at 100–450(–800) m altitude, often together with xerophytic Euphorbia spp. The mean annual rainfall in the area of distribution is 300–900 mm, with (7–)9–10 dry months. The mean annual temperature is 23°C. Alluaudia procera is most commonly found on well-drained calcareous or alluvial soils, but also on gneissic, sandy and sandstone soils. The weight of 1000 seeds is about 1.5 g. The best period for sowing is December. The germination rate is low; some tests showed a germination rate of only 0.1%. Some seeds germinate already 6–9 days after sowing, but germination may take up to 4 months. Seedlings are susceptible to damping off and watering should be done carefully. Seeds can be stored up to 6 months. Propagation by cuttings is easy, and plants can also be successfully propagated by layering and root suckers. Rootstocks of Alluaudia procera have been used successfully for grafting several other species of Didiereaceae from Madagascar. In plantations seedlings should be protected against browsing by cattle. 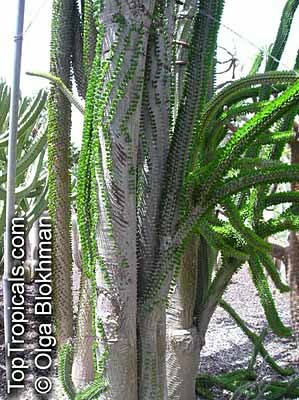 In the early 1970s it has been estimated that the area of distribution of Alluaudia procera comprises about 200,000 ha. 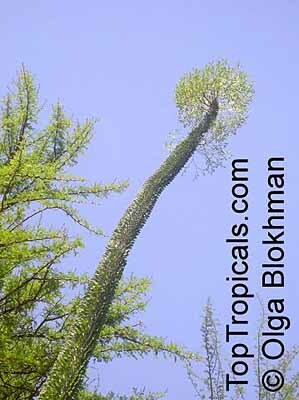 Locally, Alluaudia procera is dominant, and although the bole diameters are moderate, the total bole volume per ha can be quite high, sometimes more than 300 m³ with 2000 boles of over 8 cm diameter. However, the bark is thick and represents 32–55% of the bole volume. On favourable sites on red sands, the net wood volume is up to 80 m³/ha. The thinning of natural stands promotes diameter growth. It is recommended to process the wood as soon as possible after felling to avoid attacks by fungi and insects, or to treat it immediately with preservatives. Although Alluaudia procera and some other Alluaudia spp. are locally common or even dominant, some concern is needed about the decline of populations. Alluaudia procera has been included in the IUCN Red List, although it still is considered to be at lower risk but near threatened. Much of the dry forest in southern Madagascar has been replaced by grassland, whereas the exploitation of Alluaudia procera for its timber is another serious threat. All species of Didiereaceae, including Alluaudia procera, have been listed in Appendix II of the Convention on International Trade in Endangered Species of Wild Fauna and Flora (CITES). This has been done to monitor the international trade in especially live plants for succulent lovers. Alluaudia procera will remain a timber tree of some local importance as long as stands of sufficient extent exist. Although some protected areas have been established for this species and other Alluaudia spp., more research attention is still needed for protection of these peculiar plants which are so characteristic for southern Madagascar. Gachet, C., 1969. Etude de la croissance et de la régénération du Fansilotra (Alluaudia procera). CTFT de Madagascar, Antananarivo, Madagascar. 46 pp. Rauh, W., 1963. Didieréacées (Didiereaceae). Flore de Madagascar et des Comores (plantes vasculaires), famille 121. Muséum National d’Histoire Naturelle, Paris, France. 37 pp. Rauh, W. & Dinklage, W., 1978. 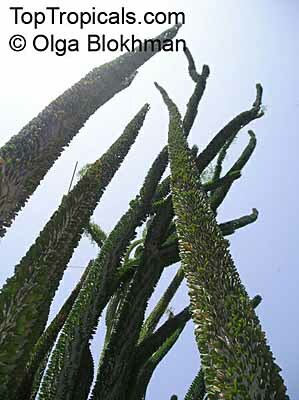 A new method of propagation of Didierea madagascariensis H.Baill. Cactus and Succulent Journal 50(3): 132–133. Kubitzki, K., 1993. Didiereaceae. In: Kubitzki, K. (Editor). The families and genera of vascular plants. Volume 2. Flowering plants - dicotyledons, Magnoliid, Hamamelid and Caryophyllid Families. Springer-Verlag, Berlin, Heidelberg, Germany. pp. 292–295. Parant, B., Chichignoud, M. & Rakotovao, G., 1985. Présentation graphique des caractères technologiques des principaux bois tropicaux. Tome 5. Bois de Madagascar. CIRAD, Montpellier, France et Département des Recherches forestières et piscicoles du FOFIFA, Antananarivo, Madagascar. 162 pp. Thiel, J., 1973. Traitement de planches de Fansilotra par trempage à froid. CTFT de Madagascar, Antananarivo, Madagascar. 24 pp. Louppe, D. & Lemmens, R.H.M.J., 2010. Alluaudia procera (Drake) Drake. In: Lemmens, R.H.M.J., Louppe, D. & Oteng-Amoako, A.A. (Editors). PROTA (Plant Resources of Tropical Africa / Ressources végétales de l’Afrique tropicale), Wageningen, Netherlands. Accessed 11 April 2019. This page was last modified on 23 March 2017, at 20:00.